Specialized labels for barcode label printers. 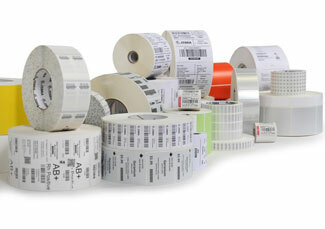 PTS is a leading supplier of Barcode Labels for Mobile, Desktop and Industrial printers from Zebra and SATO. Choosing the right label is essential when implementing barcode labeling solutions and we offer a wide variety of materials and sizes to meet your specific needs. Unsure of which label to choose? Check out the Zebra Supplies Selector Tool to input your specific printer model and environmental factors. If you can't find what you are loong for, contact us at 877-640-4152 and we'll get the right label for you. 3.00" x 2.00", Thermal Transfer, Kimdura Polypropylene, PolyPro 4000T, 3.00" Core, 8.00" Outer Diameter, Permanent, for use with Industrial Printers. 3.25" x 5.50", Thermal Transfer, Kimdura Polypropylene, PolyPro 4000T, 3.00" Core, 8.00" Outer Diameter, Permanent, for use with Industrial Printers. 4.00" x 3.00", Thermal Transfer, Kimdura Polypropylene, PolyPro 4000T, 3.00" Core, 8.00" Outer Diameter, Permanent, for use with Industrial Printers. 4.00" x 6.00", Thermal Transfer, Kimdura Polypropylene, PolyPro 4000T, 3.00" Core, 8.00" Outer Diameter, Permanent, for use with Industrial Printers. 5.00" x 8.00", Thermal Transfer, Kimdura Polypropylene, PolyPro 4000T, 3.00" Core, 8.00" Outer Diameter, Permanent, for use with Industrial Printers. 2.00" x 1.00", Thermal Transfer, Kimdura Polypropylene, PolyPro 4000T Removable, 3.00" Core, 8.00" Outer Diameter, Removable, for use with Industrial Printers. 3.00" x 1.00", Thermal Transfer, Kimdura Polypropylene, PolyPro 4000T Removable, 3.00" Core, 8.00" Outer Diameter, Removable, for use with Industrial Printers. 3.00" x 2.00", Thermal Transfer, Kimdura Polypropylene, PolyPro 4000T Removable, 3.00" Core, 8.00" Outer Diameter, Removable, for use with Industrial Printers. 4.00" x 2.00", Thermal Transfer, Kimdura Polypropylene, PolyPro 4000T Removable, 3.00" Core, 8.00" Outer Diameter, Removable, for use with Industrial Printers. 4.00" x 3.00", Thermal Transfer, Kimdura Polypropylene, PolyPro 4000T Removable, 3.00" Core, 8.00" Outer Diameter, Removable, for use with Industrial Printers. 4.00" x 2.00", Thermal Transfer, Paper, Z-Perform 1500T, 3.00" Core, 8.00" Outer Diameter, Permanent, for use with Industrial Printers. 4.00" x 3.00", Thermal Transfer, Paper, Z-Perform 1500T, 3.00" Core, 8.00" Outer Diameter, Permanent, for use with Industrial Printers. 4.00" x 4.00", Thermal Transfer, Paper, Z-Perform 1500T, 3.00" Core, 8.00" Outer Diameter, Permanent, for use with Industrial Printers. 4.00" x 6.00", Thermal Transfer, Paper, Z-Perform 1500T, 3.00" Core, 8.00" Outer Diameter, Permanent, for use with Industrial Printers. 4.00" x 8.00", Thermal Transfer, Paper, Z-Perform 1500T, 3.00" Core, 8.00" Outer Diameter, Permanent, for use with Industrial Printers. 4.00" x 6.00", Thermal Transfer, Paper, Z-Perform 2000T, 3.00" Core, 8.00" Outer Diameter, Permanent, for use with Industrial Printers. 4.00" x 3.00", Thermal Transfer, Paper, Z-Perform 2000T, 3.00" Core, 8.00" Outer Diameter, Permanent, for use with Industrial Printers. 4.00" x 6.50", Thermal Transfer, Paper, Z-Perform 2000T, 3.00" Core, 8.00" Outer Diameter, Permanent, for use with Industrial Printers. 3.00" x 1.50", Thermal Transfer, Polyester, Z-Ultimate 2000T, 3.00" Core, 8.00" Outer Diameter, Permanent, for use with Industrial Printers. 1.50" x 0.75", Thermal Transfer, Polyester, Z-Ultimate 2000T, 3.00" Core, 8.00" Outer Diameter, Permanent, for use with Industrial Printers. 1.50" x 0.50", Thermal Transfer, Polyester, Z-Ultimate 4000T, 3.00" Core, 8.00" Outer Diameter, Permanent, for use with Industrial Printers. 2.00" x 0.50", Thermal Transfer, Polyester, Z-Ultimate 4000T, 3.00" Core, 8.00" Outer Diameter, Permanent, for use with Industrial Printers. 2.00" x 1.00", Thermal Transfer, Polyester, Z-Ultimate 4000T, 3.00" Core, 8.00" Outer Diameter, Permanent, for use with Industrial Printers. 3.00" x 1.00", Thermal Transfer, Polyester, Z-Ultimate 4000T, 3.00" Core, 8.00" Outer Diameter, Permanent, for use with Industrial Printers. 3.00" x 3.00", Thermal Transfer, Polyester, Z-Ultimate 4000T, 3.00" Core, 8.00" Outer Diameter, Permanent, for use with Industrial Printers. 4.00" x 2.50", Thermal Transfer, Polyester, Z-Ultimate 4000T, 3.00" Core, 8.00" Outer Diameter, Permanent, for use with Industrial Printers. 4.00" x 6.00", Thermal Transfer, Polyester, Z-Ultimate 4000T, 3.00" Core, 8.00" Outer Diameter, Permanent, for use with Industrial Printers. 3.00" x 2.00", Thermal Transfer, Polyester, Z-Ultimate 4000T Clear, 3.00" Core, 8.00" Outer Diameter, Permanent, for use with Industrial Printers. 3.00" x 1.00", Thermal Transfer, Polyester, Z-Ultimate 4000T High-Tack, 3.00" Core, 8.00" Outer Diameter, High-Tack, for use with Industrial Printers. 3.00" x 2.00", Thermal Transfer, Polyester, Z-Ultimate 4000T High-Tack, 3.00" Core, 8.00" Outer Diameter, High-Tack, for use with Industrial Printers. 4.00" x 2.00", Thermal Transfer, Polyester, Z-Ultimate 4000T High-Tack, 3.00" Core, 8.00" Outer Diameter, High-Tack, for use with Industrial Printers. 4.00" x 6.00", Thermal Transfer, Polyester, Z-Ultimate 4000T High-Tack, 3.00" Core, 8.00" Outer Diameter, High-Tack, for use with Industrial Printers. 2.00" x 1.00", Thermal Transfer, Polyester, Z-Ultimate 4000T High-Tack, 3.00" Core, 8.00" Outer Diameter, High-Tack, for use with Industrial Printers. 0.75" x 0.25", Thermal Transfer, Polyimide, Z-Supreme 2000T, 3.00" Core, 8.00" Outer Diameter, High-temp, for use with Industrial Printers. 1.00" x 0.25", Thermal Transfer, Polyimide, Z-Supreme 2000T, 3.00" Core, 8.00" Outer Diameter, High-temp, for use with Industrial Printers. 1.50" x 0.25", Thermal Transfer, Polyimide, Z-Supreme 2000T, 3.00" Core, 8.00" Outer Diameter, High-temp, for use with Industrial Printers. 2.00" x 1.00", Thermal Transfer, Polyester, Z-Xtreme 4000T High-Tack, 3.00" Core, 8.00" Outer Diameter, High-Tack, for use with Industrial Printers. 0.90" x 0.90", Thermal Transfer, Polyester, Z-Xtreme 5000T, 3.00" Core, 8.00" Outer Diameter, Permanent, for use with Industrial Printers. 2.00" x 1.00", Thermal Transfer, Polyester, 8000T Void Matte, 3.00" Core, 8.00" Outer Diameter, Tamper-evident, for use with Industrial Printers. 2.00" x 2.00", Direct Thermal, Paper, Z-Perform 1000D, 3.00" Core, 8.00" Outer Diameter, Permanent, for use with Industrial Printers. 3.00" x 1.00", Direct Thermal, Paper, Z-Perform 1000D, 3.00" Core, 8.00" Outer Diameter, Permanent, for use with Industrial Printers. 4.00" x 2.00", Direct Thermal, Paper, Z-Perform 1000D, 3.00" Core, 8.00" Outer Diameter, Permanent, for use with Industrial Printers. 4.00" x 3.00", Direct Thermal, Paper, Z-Perform 1000D, 3.00" Core, 8.00" Outer Diameter, Permanent, for use with Industrial Printers. 4.00" x 4.00", Direct Thermal, Paper, Z-Perform 1000D, 3.00" Core, 8.00" Outer Diameter, Permanent, for use with Industrial Printers. 4.00" x 6.00", Direct Thermal, Paper, Z-Perform 1000D, 3.00" Core, 8.00" Outer Diameter, Permanent, for use with Industrial Printers. 4.00" x 6.50", Direct Thermal, Paper, Z-Perform 1000D, 3.00" Core, 8.00" Outer Diameter, Permanent, for use with Industrial Printers. 4.00" x 8.00", Direct Thermal, Paper, Z-Perform 1000D, 3.00" Core, 8.00" Outer Diameter, Permanent, for use with Industrial Printers. 2.00" x 1.00", Direct Thermal, Paper, Z-Perform 2000D, 3.00" Core, 8.00" Outer Diameter, All-Temp, for use with Industrial Printers. 2.25" x 1.25", Direct Thermal, Paper, Z-Perform 2000D, 3.00" Core, 8.00" Outer Diameter, All-Temp, for use with Industrial Printers. 3.00" x 1.00", Direct Thermal, Paper, Z-Perform 2000D, 3.00" Core, 8.00" Outer Diameter, All-Temp, for use with Industrial Printers. 3.00" x 2.00", Direct Thermal, Paper, Z-Perform 2000D, 3.00" Core, 8.00" Outer Diameter, All-Temp, for use with Industrial Printers. 4.00" x 2.00", Direct Thermal, Paper, Z-Perform 2000D, 3.00" Core, 8.00" Outer Diameter, All-Temp, for use with Industrial Printers. 4.00" x 2.50", Direct Thermal, Paper, Z-Perform 2000D, 3.00" Core, 8.00" Outer Diameter, All-Temp, for use with Industrial Printers. 4.00" x 3.00", Direct Thermal, Paper, Z-Perform 2000D, 3.00" Core, 8.00" Outer Diameter, All-Temp, for use with Industrial Printers. 4.00" x 4.00", Direct Thermal, Paper, Z-Perform 2000D, 3.00" Core, 8.00" Outer Diameter, All-Temp, for use with Industrial Printers. 4.00" x 6.00", Direct Thermal, Paper, Z-Perform 2000D, 3.00" Core, 8.00" Outer Diameter, All-Temp, for use with Industrial Printers. 4.00" x 6.50", Direct Thermal, Paper, Z-Perform 2000D, 3.00" Core, 8.00" Outer Diameter, All-Temp, for use with Industrial Printers. 2.25" x 1.25", Direct Thermal, Paper, Z-Select 4000D, 3.00" Core, 8.00" Outer Diameter, All-Temp, for use with Industrial Printers. 3.00" x 2.00", Direct Thermal, Paper, Z-Select 4000D, 3.00" Core, 8.00" Outer Diameter, All-Temp, for use with Industrial Printers. 3.50" x 1.125", Direct Thermal, Paper, Z-Select 4000D, 3.00" Core, 8.00" Outer Diameter, All-Temp, for use with Industrial Printers. 4.00" x 1.50", Direct Thermal, Paper, Z-Select 4000D, 3.00" Core, 8.00" Outer Diameter, All-Temp, for use with Industrial Printers. 4.00" x 3.00", Direct Thermal, Paper, Z-Select 4000D, 3.00" Core, 8.00" Outer Diameter, All-Temp, for use with Industrial Printers. 4.00" x 6.00", Direct Thermal, Paper, Z-Select 4000D, 3.00" Core, 8.00" Outer Diameter, All-Temp, for use with Industrial Printers. 1.50" x 1.00", Direct Thermal, Paper, Z-Select 4000D, 3.00" Core, 8.00" Outer Diameter, All-Temp, for use with Industrial Printers. 2.00" x 1.00", Direct Thermal, Paper, Z-Select 4000D, 3.00" Core, 8.00" Outer Diameter, All-Temp, for use with Industrial Printers. 2.25" x 2.50", Direct Thermal, Paper, Z-Select 4000D, 3.00" Core, 8.00" Outer Diameter, All-Temp, for use with Industrial Printers. 2.25" x 4.00", Direct Thermal, Paper, Z-Select 4000D, 3.00" Core, 8.00" Outer Diameter, All-Temp, for use with Industrial Printers. 3.00" x 1.00", Direct Thermal, Paper, Z-Select 4000D, 3.00" Core, 8.00" Outer Diameter, All-Temp, for use with Industrial Printers. 3.00" x 3.00", Direct Thermal, Paper, Z-Select 4000D, 3.00" Core, 8.00" Outer Diameter, All-Temp, for use with Industrial Printers. 3.50" x 1.00", Direct Thermal, Paper, Z-Select 4000D, 3.00" Core, 8.00" Outer Diameter, All-Temp, for use with Industrial Printers. 4.00" x 2.50", Direct Thermal, Paper, Z-Select 4000D, 3.00" Core, 8.00" Outer Diameter, All-Temp, for use with Industrial Printers. 4.00" x 4.00", Direct Thermal, Paper, Z-Select 4000D, 3.00" Core, 8.00" Outer Diameter, All-Temp, for use with Industrial Printers. 4.00" x 6.50", Direct Thermal, Paper, Z-Select 4000D, 3.00" Core, 8.00" Outer Diameter, All-Temp, for use with Industrial Printers. 4.375" x 6.875", Direct Thermal, Paper/Polypropylene, Z-Slip, 3.00" Core, 8.00" Outer Diameter, Permanent, for use with Industrial Printers. 6.625" x 6", Direct Thermal, Paper/Polypropylene, Z-Slip, 3.00" Core, 8.00" Outer Diameter, Permanent, for use with Industrial Printers. 3.50" x 1.00", Direct Thermal, Paper, Z-Perform 2000D, 3.00" Core, 8.00" Outer Diameter, Permanent, for use with Industrial Printers. 4.00" x 1.00", Direct Thermal, Paper, Z-Perform 2000D, 3.00" Core, 8.00" Outer Diameter, Permanent, for use with Industrial Printers.